At 0910 on March 11, 1945, Flight Petty Officer 1st Class Masanori Anami took off from Kanoya Air Base as navigator/observer in a three-man Ginga bomber (Allied code name of Frances) carrying an 800-kg bomb. He was a member of the Kamikaze Special Attack Corps Azusa Special Attack Unit. He died in a special (suicide) attack at the age of 19 . He was from Miyazaki Prefecture and was a member of the 13th Hei Class of the Navy's Yokaren (Preparatory Flight Training Program). The name of Azusa Special Attack Unit came from the death poem of Kusunoki Masatsura, who was a general in the Nanbokuchō Period (1336-1392) and the heir of Kusunoki Masashige. The Azusa Special Attack Unit, which would not return again, was formed with 24 land-based Ginga bombers (Allied code name of Frances) and 72 men. With fuel for only one way, they flew 1,600 nautical miles (about 2,930 kilometers) to Ulithi, which took more than ten hours. It was a special attack unit that clearly indicated that they would carry out taiatari (body-crashing) attacks. Thank you for your letter. I am so glad that you are doing well. I am glad to tell you that I also am well working hard with my military duties. The war situation has become more and more serious. There are surely matters of great importance that are the responsibility of Japanese men like us. No, everyone has this responsibility. Today the Japanese mainland is a battleground. We will certainly win if we carry out taiatari (body-crashing) attacks as our duty. Please take care of yourself as you work. As a favor to me, please be friends with Masashi and the others until they return home in May. My burning in flames from the air attack will be successful. The letter comes from Jinno (2000, 147). The biographical information in the first paragraph comes from Jinno (2000, 147) and Osuo (2005, 180). The background information in the second paragraph comes from Kanoya Kōkū Kichi Shiryōkan Renraku Kyōgikai (2003, 19). 1. Computed based on birth year of 1925 given in Tokkōtai Senbotsusha 1990, 148. Jinno, Masami. 2000. 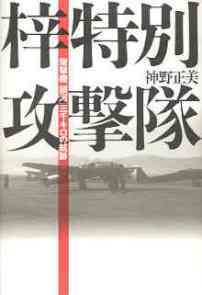 Azusa tokubetsu kōgekitai: Bakugekiki "Ginga" sanzen kiro no kōseki (Azusa special attack unit: "Ginga" bombers' 3,000-km flight path). Tōkyō: Kōjinsha. Kanoya Kōkū Kichi Shiryōkan Renraku Kyōgikai (Kanoya Air Base Museum Coordinating Committee). 2003. Kokoro no sakebi (Cries of the heart). Kanoya, Kagoshima Prefecture: Kanoya Kōkū Kichi Shiryōkan Renraku Kyōgikai.